“Why yes dear, I’ll be happy to make you a corner cabinet.” (Like I was really going to say NO!) Here’s a quick HSA (Husband Service Announcement) for the fellas, learn to pick and choose your battles… this ain’t one of them or at least not for me. 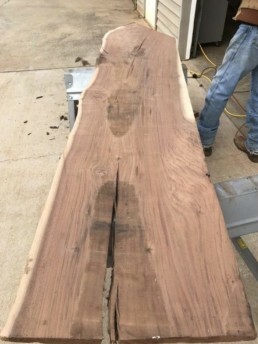 I like making things, for that reason we harvested a huge Black Walnut tree a few years ago. My wife’s been designing all sorts of things and I’ve been keeping the blades sharp if you know what that means…”keep the home fires burning” if you follow me!! 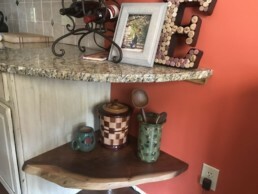 When we replaced our kitchen counter tops Rene’ knew exactly what she wanted, she laid out a half crescent shape at the end of our cabinets. 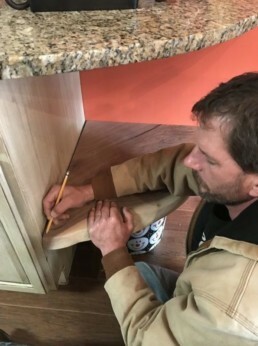 I said, “That’s a big gap between the counter and floor!” Should have known to never question her “process”…that big gap was there for a reason! So I cut and measured. You may notice I left a raw edge and manipulated it to have a natural curvature. This is the beauty in harvesting your own lumber, it would be a crime to cut that edge off and make a 90° angle! Nope not in this house! Here’s the finished product, but it doesn’t stop there guys! Bonus points for me by bringing home the accessories! You may have heard or maybe not, it really wasn’t talked about much…NOT! My little brother got married; well while we were celebrating his bachelor party excursion, I had the chance to pick up this handmade clay vase and coffee mug along with a hand carved wooden ice bucket by a local artist on an island. Rene’ loves clay pottery, but she loves it even more when it comes from the local folks themselves! Let’s face it, a husband that thinks to bring home presents like that from a bachelor party deserves a little credit, this ain’t my first rodeo! Like all projects on my honey-do-list, they make me mad. It’s not for having to work on, but because the wifey is right again with another cool design. Like I said, NEVER question “the process”. Until next time DIY or DIE!